According to several sources, Apple’s App Store, known for being a strictly regulated closed ecosystem, has been infiltrated with malware that our friends over at Palo Alto Networks‘ Unit 42 are calling XcodeGhost. Unit 42 initially discovered that the malware had infected 39 iOS apps (a number that keeps climbing and is north of 50 apps at time of publishing) potentially impacting hundreds of millions of users by embedding malicious code into specific iOS apps. Claud Xiao, author of the technical blog post, states that the XcodeGhost code embedded into infected iOS apps is capable of receiving commands from the attacker through a C2 server to prompt a fake alert dialog to phish user credentials, hijack opening specific URLs based on their scheme (which could allow for exploitation of vulnerabilities in the iOS system or other iOS apps), and read and write data in the user’s clipboard (which could be used to read the user’s password if that password is copied from a password management tool). According to a BBC News article, researchers at the e-commerce site Alibaba initially flagged the malware. It was discovered that the hackers had uploaded several altered versions of Xcode — a tool used to build iOS apps — to a Chinese cloud storage service. Then, about six months ago, the attackers posted links to the software on several forums commonly visited by Chinese developers. Let’s take a look at the C2 domains in question from the perspective of the OpenDNS Global Network Infrastructure. The first domain associated with XcodeGhost is init[.]crash-analytics[.]com. 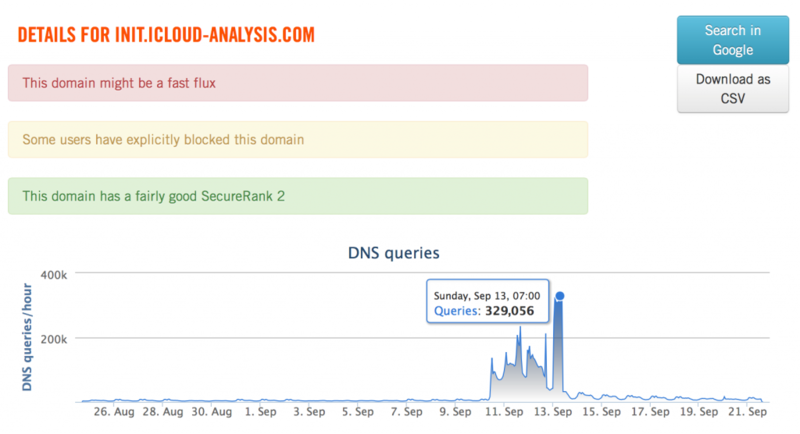 As you can see from the OpenDNS Investigate details below, we observed very few queries over the the past 30 days. The registrant for this domain utilizes a Tencent QQ, popularly known as QQ, email address. Past investigations have shown that QQ accounts (both instant messaging and email) are relatively easy to register and require very little validation of an individual’s authenticity. The IP address and name servers for this domain are on different networks that, although common, becomes an indicator to note. The second domain, init[.]icloud-diagnostics[. ]com, has noticeably more traffic and a dramatic upswing in queries starting September 11. A look at the WHOIS information for this domain shows that the domain was registered by the same individual that registered init[.]crash-analytics[.]com. If we pivot on the registrant email address we can see that 18 known domains are associated with this registrant. 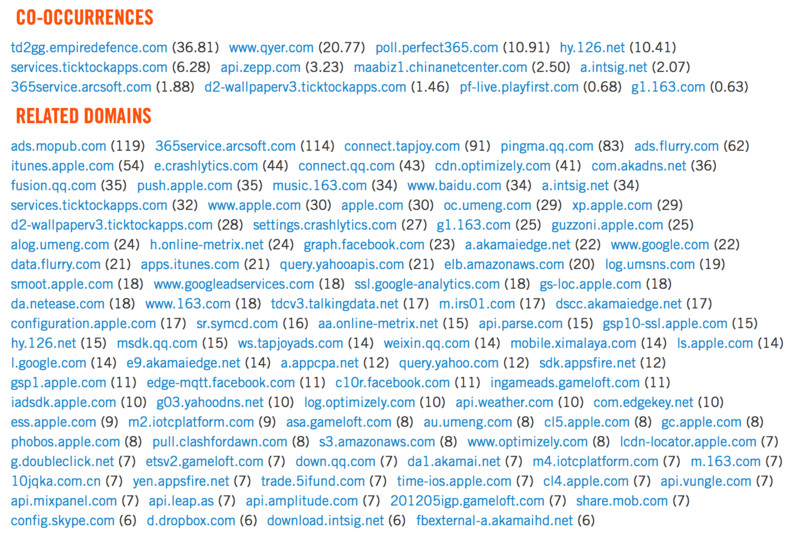 Some interesting slightly suspiciously named domains include allsdk[. ]org, ioscode[. ]org, iossdk[. ]org, iostool[. ]com, sdkdev[. ]net, and sdkdev[.]org. This domain has also recently changed from using an Amazon AWS CNAME (which will surface later in this post) to the same IP address hosting init[.]crash-analytics[.]com. As we can see, this IP address is hosting several domains owned by the registrant. Pivoting on the IP address, which is located in Singapore, we can see that it is associated with AS 63949, which is owned by hosting provider Linode. The third domain, init[.]icloud-analysis[. ]com, shows the most significant spike in queries of the three. As you can see below, the query volume accelerates on September 11 and peaks over 330,000 queries. That is until the query volume normalizes on September 13 at 10:00am GMT. Unlike the other two domains the WHOIS information does not show the same registrant email address or name server information. 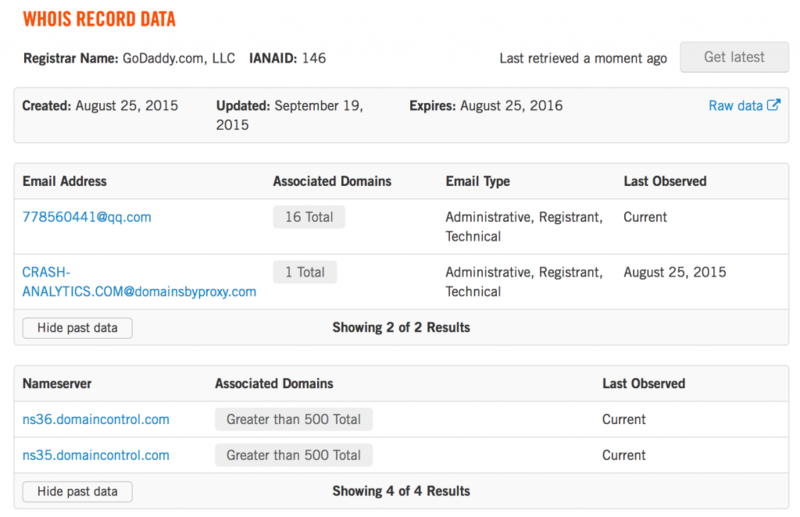 We can note, however, that at one time all three domains had an @domainsbyproxy.com registrant email address which can be used to draw a loose association between the domains. What we do see, however, is the reappearance of the Amazon AWS CNAME that was previously associated with init[.]icloud-diagnostics[. ]com, effectively associating these domains with one another. If we pivot on the CNAME associated with the domain, we see a significant spike in traffic on the day it was associated with the init[.]icloud-analytics[. ]com domain. 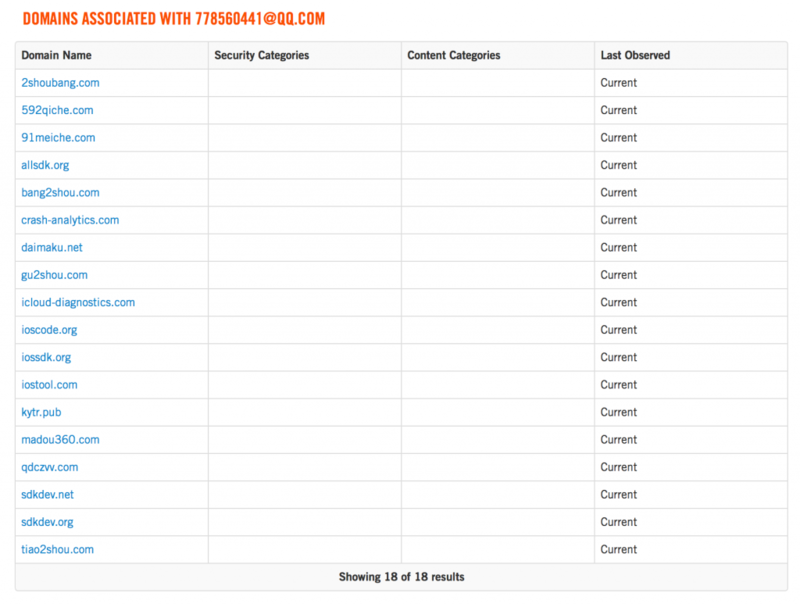 If we take a look at the co-occurrences and related domains for init[.]icloud-analysis[. 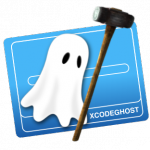 ]com we can see several Apple app-related names emerge, several of which are associated with apps identified as being compromised by the XcodeGhost malware. These include, NetEase, Perfect365, Qyer, and WeChat, in addition to domains associated with app publishers like TickTockApps (creator of Wallpapers10000), which also have been identified as compromised. It’s been reported that the majority of people affected were in China and our own data corroborates this claim using OpenDNS Investigates Requester Geo Distribution metric. Unsurprisingly, however, we notice substantial queries originating from the US, Australia, Canada, Brazil, India, Vietnam, Italy, and Great Britain – all of which are countries with a sizable Chinese-speaking populations. 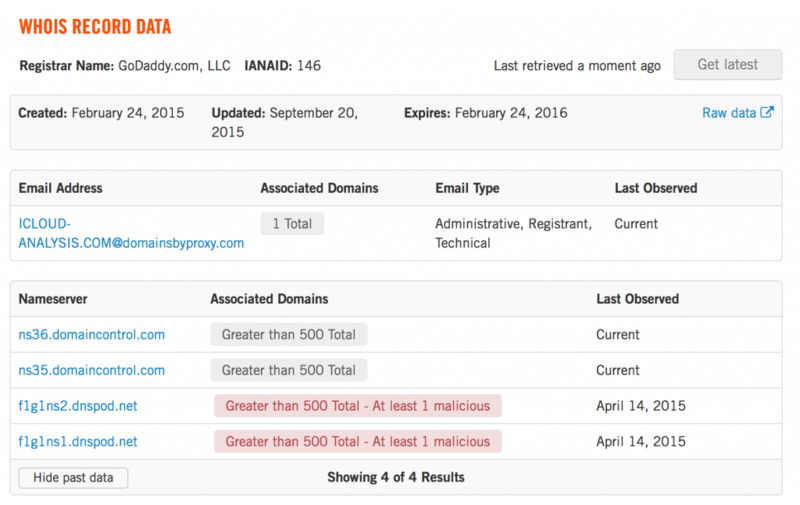 Using OpenDNS Investigate we’ve walked through an investigation, or rather corroboration of, findings from a third party. Perhaps the biggest benefit is that we didn’t have to utilize a number of disparate systems to do so. The next step in our investigation will likely be to take a look at those suspiciously named SDK domains also owned by the malicious registrant. That, of course, is another blog post entirely.